A conversation with Sir Quentin Blake. Summer. On these optimistic sunshine mornings we trip out in thin clothes with bits of tissue paper for shoes, then by around 10.30 everything is ruined by the thick taunt of dark grey cloud. So it was good that I was swimming early at Royal Victoria Docks, under that first-thing sunshine. It's easier to get into twinkling water. Sun limes the green of the top few inches; it lies on your back like a soft blanket. And when you turn your head to breathe, you see how it goldens your arcing arm. Swimming in sunshine is the best. In one sense, this isn't new territory. I've swum in the docks before (doing the Great London Swim at Millwall Docks) and learned then that they're not full of dead dogs and rodent wee. I'm here because this is a new and permanent part of London's open water swimming 'offer' and I take my swimming blogger responsibilities seriously. But I've never been to this bit of London before, not even on the cable cars that whizz along on strings right above my head. Such is my self-involvement, I imagined tourists in the cars saw me in the water and said as one (in generic Euro accent) ‘mein gott, zis voman, so amazink she must be Svedish’. Over there is another vanity project I’ve never been to, the Dome. There's modern glassy flats and new-build houses in a neat row down the right dockside, offices and restaurants down the left. Ancient oily dockside machinery looms over the water like giant gawky mechanical herons. Straight down the middle, a plane takes off as if the water were its guide. This is flash new London, butting right up against the heft of our old industrial working city. Just along the way is a waterside gazebo, but don't be alarmed – that’s just where you register and get your Nowca bracelet so your swim can be tracked and timed, if that’s important to you (it’s not to me, but I do quite like people on land knowing I’m in the water). I thought for a second I’d have to change here, though that’s more of a worry for spectators than for me. I could care less, I’ve re-birthed out of a wetsuit in a minibus full of strangers. The changing area is on a nearby barge, and while its soggy floors and steep slippy stairs are not luxurious, it has showers, loos and benches which are all you need and more than some venues offer. On to the swim itself. There are three courses – 400m, 750m and 1.5k, all marked by huge buoys there’s no missing. The water was about 18degrees and I was swimming ‘in skins’, which people use to mean ‘no wetsuit’ though that seems counter-intuitive to me, somehow. Down a metal jetty then in via thin red steps. The water felt soft and was old-felt green. I took a few breaststrokes to acclimatise, always worth doing so you get your bearings, spot your first buoy, suss out where the safety kayak is. It can take a while to put your head in, but take that while. This isn’t a race; there’s no point being out here if you’re not going to get pleasure in your surroundings. I’ve been mostly swimming in a lake this summer, which has a particular taste. So does the lido, it changes according to the rain/suncream/chlorine ratios. I'm at the stage where you could blindfold me, put me in water and I could tell you what kind of water it is. ‘Hmm. Goosey. Lake’. Or 'I’m getting distinct back tones of pee, I’d say six year old vintage? Lido’. This is different. It doesn’t have a peaty grit, or a cold top of the mouth snap, or a salty diesel bite, all of which I've recently tasted. I’m recalling it sitting here writing this; it’s the taste of old water, a slight texture, soft and not unpleasant. This is clearly not a exhortation to drink the stuff. I head over to the first round buoy marking the 1.5k course. I’m right near an old dark wood jetty. A bit too near, its oppressive and above me tower these dock cranes. I can keep going, right up to the far buoy under a high modern bridge. It looks like out to sea. (It's clearly not.) Or I can turn and go across the dock. And suddenly, from nowhere, I feel vulnerable. I can see the safety kayaker right bloody THERE. But everything is enormous down here in the water. The dock machinery looms, the buoy is far on lonely water. And I get The Fear. Not the Sea Fear, which is when the tentacle of some unknown beast will slide up from the deeps, sucker and coil round my leg and drag me down. Not that fear. Another one, that I’m small and alone, a tiny ant that the water could overwhelm in a flash (I did say, didn’t I, that the safety kayaker was RIGHT BLOODY THERE). The fear that I might just let go. Stop, and fall deep like an autumn leaf falls. The one where you might step in front of the tube. It's a fear almost of oneself. And I could feel it bubbling in me, so I struck out across the water to the 750m buoy across on the other side, trying to keep my breathing steady and not go into full panic mode, not least because it's embarrassing. And the walls on that side were high, I couldn’t have scaled them and it didn’t feel like fun and I wanted to be out. So I swam in. That bit of the story is not about the space, it’s about me. It has happened to me in a lido, it’s happened to me when I’ve been swimming with friends. Sometimes it just happens. And sometimes when it COULD happen, when the sea is rough or no one could reach me, it doesn’t. But even when it happens, I still don’t regret that swim. I never regret a swim. Next time I come here (and I will, and you should too) it won’t happen, and I won’t believe I felt that way. I’ll maybe laugh at my stupid human vulnerability. The jetty pricked my cold feet as I clambered out, and I stopped to chat with the organiser who is full of good plans for this place – running it year round, for instance. Yes please. We talked about jellyfish, of which there are none. I warmed myself in the sun, before those clouds, bang on time, started to come over. I had a hot shower, took some snaps, and got back on the DLR with tourists and people going into Canary Wharf for their proper jobs. And just had that teeny and unattractive bit of smugness we swimmers can get. Wanted to say ‘you’ll never guess where I’ve just swum’. Add this one to your London list, and we can have that conversation together. 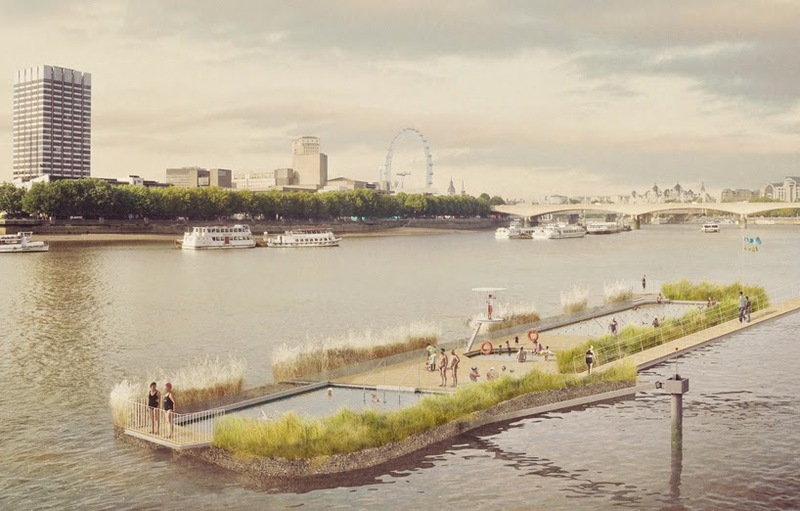 THAMES BATHS - SWIM THE FUTURE! UPDATE: As of Tues 18th May, the kickstarter was a SUCCESS! Feel Actual Emotion for all the people who've worked so hard to make this happen. Congratulations, you lot! Really look forward to swimming in Thames Baths. I've spent some considerable time swimming round London. I've swum in more of the city's pools than most. And as is abundantly clear, my true love is swimming outdoors. I love what it does, I love having air on my skin, I love how every day is different, I love it in the rain and sun. There is something elemental about it that we are essentially cut off from in most parts of our lives. In London particularly, we are heated and cooled and bustled and jostled around, all our experiences tightly controlled, our access to nature doled out in tiny plantpot-sized portions. Swimming outdoors is a great antidote to all of that. I also (mostly) love this city, particularly the public bits of it. As everything round us gets corporatised and privatised and reserved and oligarched, the public stuff we do have gets increasingly important. I look at that proposed new bridge and I despair. This is not for 'us'. This is not about community. And I think how ironic, that something that crosses a river will actually be so divisive. Never have the words 'judicial review' gladdened me so much. But here's something. Something for all of us. All the swimming community (and what a community we are) and beyond. Thames Baths is the project that hopes to put a lido in the Thames. A year-round, 'gently-warmed' public amenity, in the Thames. Amazing thought, eh? I think so. It will be safe, sustainable, and at £10million, around a 20th of the cost of that wretched bridge. Thames Baths - who incidentally are not some faceless conglomerate, they're three Londoners, you can see them on the link - are launching a crowdfunder to raise £125k to get to the next stage of development. It looks like a big chunk of ££. Hey, it IS a big chunk, there's no getting round that. But this isn't ££ that is going on some CEO jolly with celebrities (shorthand for 'I met Joanna Lumley* and she entranced me with her twinkly eyes'). This isn't ££ that will be spent 'attracting overseas investment' (shorthand for 'sold off to companies who put their tax offshore'). This is carefully controlled and budgeted to bring the project to the next stage, to make it ACTUALLY HAPPEN! If you have the wherewithal to contribute at any level, please please do. If you know rich folk who care about the future of swimming, or frankly hate it but just ooze philanthropy - please shove this under their noses. This isn't a selfish, roped-off, benefits-just-for-MEEEEE project, this is for all swimmers. And we are multitude! We want to swim the future! LET'S DO THIS THING! I've never done so many !! in my life. It's because I really care about this project. I want to swim the fu ... yeah. you got that already. But thanks for reading. Do share it around. All the kickstarter info and some great pics are here: Thames Baths. *No disrespect to Joanna Lumley. I'm sure she's fabulous. It's just ... weird, innit? However, if she'd throw her obviously considerable charms behind a lido not a bridge, I'd probably feel differently. * Oh and other celebrities are available. Always. There are two swimming seasons in the media. One is around Christmas/New Year ('Look at all these fools jumping in cold water!') and the other is summer ('It's hot! Jump in cold water!'). We're just starting with the annual crop of 'here's the best places to swim in London', but they're often written by people who haven't swum in many, so it all becomes a bit of a 'lucky dip'. Yeah. I did say that. So instead of relying on half-baked lists that don't really know what they're talking about, here's my top five, and then the rest. You don't need another list, you just need this one, it's got the lot. And then get my book for full info. You'll be truly Swimming London. And by the way, the book also has loads of brilliant photos, taken by the very talented Luisa Martelo. She did NOT take the pics on this blog, I did with my phone. I am a bad photographer, but even I can't ruin Tooting Lido. You WILL need to check on opening dates - not all of these are open all year round. And if I've missed any out, yell at me on Twitter @jennylandreth. Nicely, please. TOOTING LIDO Unheated 90m, glorious, biggest and best. The sunny pic above is Tooting Lido. Open to the public from May - that means NOW. CHARLTON LIDO Also 50m, heated but not madly. This pool has been done up recently. It's a great swim, now FIRMLY in my top five. FIRMLY. The pic at the bottom is Charlton. PARLIAMENT HILL LIDO 60m, cold, open all year. Right by Hampstead Heath. LONDON DOCKLANDS a new addition. A GREAT addition. Three courses (400, 750m and 1.5k) with cable cars racing overhead, planes taking off over you from City airport, the Dome practically next door. GO. HAMPSTEAD PONDS which has a ladies, a men's and a mixed bathing pond. HILLINGDON Leisure Centre In Uxbridge. Lovely big pool, never very busy. Unheated. RICHMOND POOLS ON THE PARK One indoor heated pool and one small cold outdoor one with weird steps. THE SERPENTINE Right in Hyde Park. I once had a funny swim here with my friend Becky. Remind me to tell you when we meet. HAMPTON Very heated. Very bacon baguettes. OASIS Packed. Covent Garden One indoor, one tiny outdoor pool. PARK ROAD LEISURE CENTRE. Beyond Crouch End, even. This one has apparently been done up since I visited. But the pool remains the same. and last but honestly not least, and really worth a visit, our newest addition: KINGS CROSS POND. You have to book in advance. IT IS WORTH IT. It's more the kind of place you dandle around in, than train for a 10k. That first link goes to my review, but this one goes to the ticket shop. TICKET LINK. Now, be warned. These places aren't 'swimming spots'. They are 'open water swimming spots'. I hope you know the subtle difference; if not you can ask me and I'll try not to be sarcastic in response. You'll meet loads of triathletes, wetsuits may be compulsory, and the opening hours are limited. BUT, so nice to get a decent lake swim in, eh? WEST RESERVOIR - Stoke Newington. Rather a brilliant building attached. THORPE LAKE - right out on the M25, west. You can see Thorpe Park rides above the trees. HERON LAKE - Near Thorpe Lake. HAM LAKE - Not actually a ham lake. IN Ham, not OF ham. DENHAM LAKE - a bit like being on holiday. LEYBOURNE LAKE. I started swimming there last year. It's not v crowded, there's very basic facilities but it's a lovely swim. See you there. 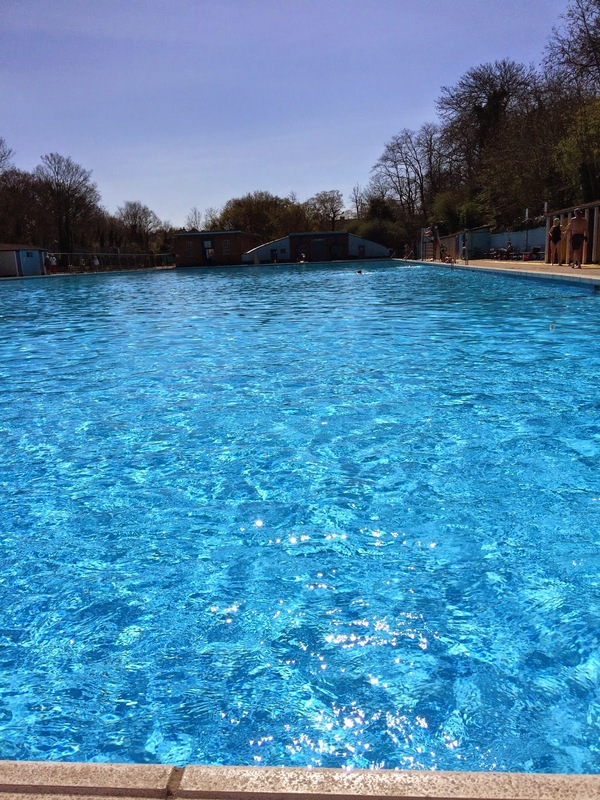 If you feel like getting out of the city but have limited travel time, try either GUILDFORD LIDO and last but DEFINITELY not least, as it's the oldest public freshwater pool in the UK and is really rather splendid and special, PELLS POOL, LEWES. NEED A GUIDE FOR WHERE TO SWIM IN LONDON? That link above takes you to a map. The map has a dot on it for every pool I've swum in and reviewed. If you click on the dot, it takes you to my review. It's a handy guide to some of the best places to swim in London, and some of the worst. These are all public pools. THIS link - Swimming London - takes you to the page on Hive.co.uk for my book, which is called, surprisingly, Swimming London. The book is a guide to the best 50 places to swim in London. It all makes sense when you think about it. The book is mostly public spaces. Lakes, bits of the river, lidos and indoor pools. There are a couple of examples of great private pools, so we can press our noses to the glass in wonder. It's already out of date, such is the nature of these things. Charlton Lido, for instance, is newly re-vamped and now on my Top 5 of London pools. And if you're interested in what I've written for the Guardian about swimming, all the pieces are here. Hope this all helps you find a great place to swim in London. In the height of our glorious summer, my lovely sister-in-law challenged me to the Ice Bucket Challenge. I didn’t do it then - not just because I hate doing Things That Have Become Too Popular and not just because I am a camera-avoider. I didn’t do it because I’m a cold water swimmer. Ice buckets is what we do. I decided I'd wait and do the challenge when Tooting Lido had frozen over and thus become the biggest best ice bucket in the WORLD*. You could join me. 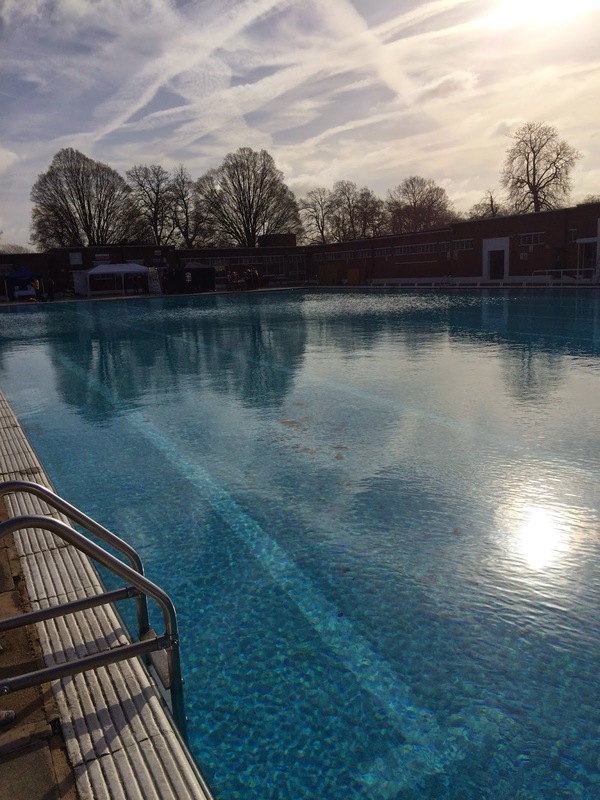 The lido hasn’t frozen over (yet) but there are plenty of opportunities over the next few weeks to get into a great big ice bucket. What do you mean, that doesn't fill you with glee? The numbers of cold water people are growing – a source of great pleasure to me (hurrah! more people!) and annoyance (booo, more people). Here follows a handy guide to upcoming events, compiled as if I was Time Out or something. Please do one. No, that came out wrong. Please join in, I mean. I’ve written these in order of dates, not order of enthusiasm, because I’m enthusiastic about them all. If there’s a public event you think I should add, please let me know. Sat 29th Nov: The first one is the Crisis Midwinter swim at aforementioned Tooting Lido, best lido in The World*. On the day of writing this (11/11) the water was still 10 degrees but the nights are getting nippy, so don't worry the water WILL be cold enough. Sun 30th Nov: Next up is Tash Splash. At Brockwell Lido this time, which is nearly as good and always about two degrees warmer. This Streamline Swims event is raising cash for Movember charities. Facial hair not an entry requirement. 17th Jan 2015 Parliament Hill Icy Swim Hootenanny. This looks a right laugh, and as far as I can tell, contains no boogie-woogie piano, which is a bonus. They rather racily call themselves the enfant terrible of cold water events and it's by invitation only, so get in touch with them if you're keen. 24th Jan 2015: By this time, you’ll be thoroughly hooked on cold swimming. Addicted even. So this one is a MUST: the 6th UK Cold Water SwimmingChampionships. A fantastic day, and a great atmosphere. You need to get in QUICK to register, but really, it's only a width so you'll be FINE. TRUST ME. Highly recommended. I wrote about training for the Cold Water Champs before, here. It includes tips on how to do it, and clearly I can't avoid all cameras. But if you'd like more help/tips or whatever, get in touch on Twitter @jennylandreth. See you in the water. *South London. Which IS the world. Open to the public from Sat March 1st. Last time I was here, this place was a building site and I was a vision in hi-vis. 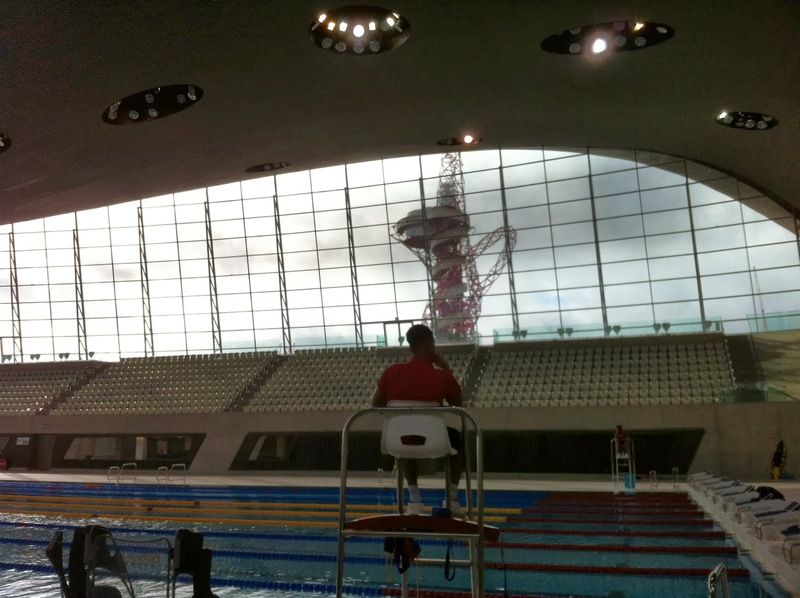 I was granted a post-Olympic backstage visit because I was writing a book about the best places to swim in London (to be published on May 1st by Aurum Press – link at the end, you know it.) It was quite a hoo-ha getting on site – it’s probably easier to get into the pool in Buckingham Palace (looks to camera. Small ‘idea’ light goes on above head). I gave up my first born, my passport, my shoe, hat n body size. Sized up, dressed up, I signed in. And I was stunned – even through all sorts of scaffolding and clattery hard-hat mess it was clear this is an utterly beautiful bit of modern architecture. I was lucky enough to go deep into the bowels of the building to the filter room (yeah, I know how odd that sounds) and I thought then, good golly if an episode of Dr Who isn’t filmed here before very long then I am a catfish. I love the doors at the main entrance. They lean away from you as you go in, and therefore towards you as you leave. You want them to make the Star Trek noise, which they don’t, so make it yourself. I love the stairs. Take the stairs down to the pool, not the lift, and see how it curls round like a snail shell, with the fixing circles in plain sight, and inset strips of clouded light. Beautiful. I love the concrete that's everywhere. It's imperfect, and I love imperfect, it suits me. It’s curved and shaped and blocky and though it’s hard, it’s warm, mellow. Like a living thing. It’s turning me into some sort of concrete hippy. Do those exist? I love the wide wide corridors and the minimal bright signage to the changing areas. Beautiful bit of design. Very modern and spacey. I love the training pool, which we never saw during the Olympics because there was a bloody great wall in the way, hiding their cool-down sessions from us. The bits where they all cried about being losers. It’s a different vibe to the main pool – there’s a low, carved ceiling like a middle eastern potato waffle, the light glows. It feels safe, ambient, enclosed. I love the bright lemon yellow chunky lockers. I love them. I want everything in my house to be them. I love the view from the main pool, through massive windows (new windows that replace the banks of Olympic seating, the 'ray wing' seats). Through one, you can see the massive Helter Skelter. You also get to see the sky, so there’s an ever-changing view. It’s absolutely swamped with light, but it seems self-evident to state that windows let light in. I love the main pool. I really love it. There’s plenty technical details around – like on here - it's enough for me to say, its 50m, 3m deep throughout and deck-edged, so fast. Fabulous. There's filming windows down both sides, you can see the moveable floor; underwater, the sides are quite 'busy' with all that. With the tech spec and lineage, it’s clear that this is NOT a play pool, people. ALTHOUGH, wait for it, I have learned that they have adult-size soft play stuff – like a kinda Total Wipeout set up? I mean, THAT IS COOL, huh? For a birthday party? I love the ceiling. It waves like water at the swell. It reminds me of the underside of a whale, with lights like barnacles. I love the concrete. I mentioned the concrete already, didn’t I? I love concrete. It’s because I’m from the Midlands, and from the 60s. I am brutalist through and through. I love the diving boards. They look like mammoth tusks forcing their way out of the ground. They are beautiful, curved monoliths. Put your hand on them, no go on, do it. You're touching HISTORY, man. HISTORY. I love that there's no clock, no digital timing boards nagging away. But I bet there's a clock by now. I bet it goes into that big gap behind the diving boards, that clock-shaped gap. I loved the showers, how they whip you like a horse’s tail. Yep, said that. I even loved the fact that I couldn’t quite work out the system to make them go on. Just have fun randomly waving bits of yourself around. They go on and off when you do that. OUCH. I love that there are separate female changing rooms and a changing village. That suits people like me who hate the changing village, and people not like me who hate the separate changing rooms. We’re all happy. I love that this pool is going to be priced in line with other local facilities. So it really will be legacy, because THAT’s what counts for people in the borough. I love, REALLY love, that we are SWIMMING in this extraordinary piece of architecture. It’s not a gallery, it’s not private, it’s not exclusive. It’s OURS. For SWIMMING IN. I mean, blimey. What an utter GIFT that is. I can’t quite believe it. As I swum along, relishing the fact that I was alone in a lane for probably the only time ever, I was asked by the man in the next lane what I thought of the pool, from a swimmers point of view. I told him (it was some of the above, condensed) and he put my words here. Please continue to believe I was tumble turning. What I didn't say was that I thought the water was a bit warm - four lengths in, and I was itching to rip that hat from my head. It felt warmer than training temperature - maybe pandering to its public? I'm prepared to concede I might be wrong - at this time of year everything feels warm to me. Nothing. I didn’t not love anything. Well, I didn’t love the set up from Stratford tube, because you have to walk through the piped music HELL that is Westfield. It feels stranded, a tad blasted heath-ish. But you can’t blame the pool for that, and it’s momentary. As soon as you see the massive ray, beached out there on the gravel, all that will be forgiven. Oh, and I don't love the Better website. It's not better, it's strange and difficult. Good luck perusing it. And if you get in - ENJOY. It’s OURS! I think I said that already. But WOW, eh! WOW. BOOK LINK: I’m putting the Amazon link up because you can see the lovely cover. IF you feel inclined to buy it, and I hope you do, you can do so through HIVE, who are here. Or just at a bookshop. Thank you please. I love swimming. 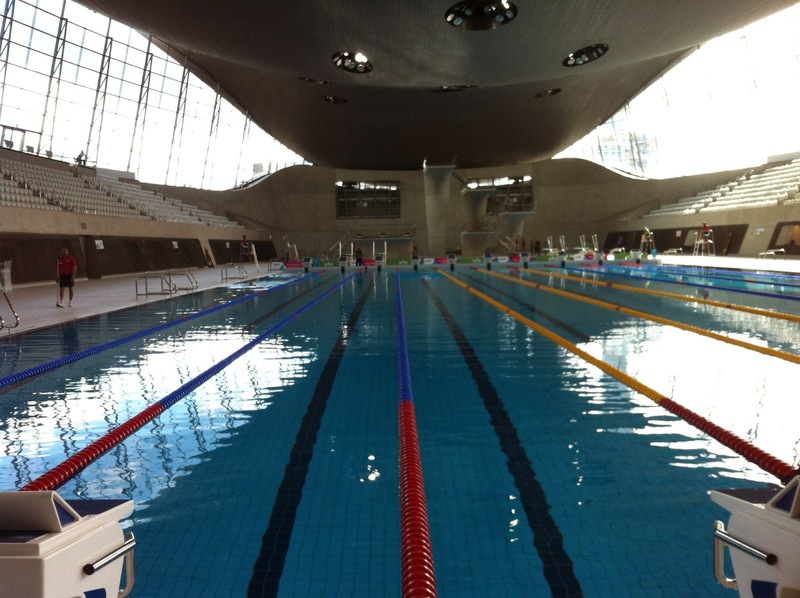 On this blog I set out to swim in London's many and various public pools, and post reviews here. N8 8JN A lido? In Crouch End?